Quit Struggling… We’ve Done All the Hard Work For You! Sell These Pre-Made, Done-for-You Products to Local Small Businesses for $297, $497, $997 or More! 47 Hot Vertical Niches… 9+GB of Top-Tier, Quality Content that you’ll be proud to put your name on. Seriously, if you’ve ever been frustrated by BAD PLR… You’re going to be ecstatic when you discover just how great these packages are! We All Know How Important Building an Email List Is… But Small Businesses Don’t! Make it Easy for Them With These DFY Packages! 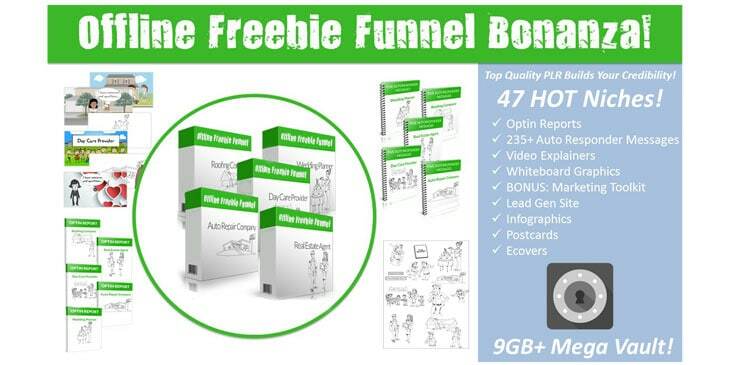 Offline Funnel Freebie Bonanza contains individual PLR products that are the entry level point that your local business clients can use to start generating leads and capturing email addresses. It simply comes down to showing your client the benefits of email marketing. We all know why email marketing is powerful, right? Hint: the money is in the list! Explain how you can do the work for them and POW you’re off and running. PLR is short for Private Label Rights. All that means is that you have the right to change the contents and information as you see fit and then sell it or give it away to your offline marketing clients. However, you DO NOT have the right to sell this product “as-is” to others. [NO] Can be sold on Tradebit or any other site like that. IMPORTANT: In short, you have the right to change the contents and information however you like and claim as your own. You can then use this package in whatever way you need to help generate clients to your offline marketing consultant practice. However, you DO NOT have the right to sell this product to others. That is what we do. However, you can always become an affiliate if you’d like to offer this product to your list. Due to the nature of this offer – being thousands of dollars worth of private licensed content – and to protect the integrity of our customers there is NO money back guarantee. We realize that this may turn some people away. And frankly we understand that this is not a great fit for everyone. But please understand, as a customer you could make your payment, download everything, use it in your business and then ask for a refund. But you would still have all of our content. That would not be fair to us nor our other customers. Therefore we have chosen to not have a money back guarantee with this offer. We have sold hundreds of products and we pride ourselves on providing top quality support. We will be there when you need us.